Thursday Feb, 13th 2014 Hello my lovely and beautiful friends. I want to talk about cords between one another. So many talk about Etereal/Etheric Cords that are our Emotional connection between individuals. These exist between the Emotional Body of our being and they connect us to one another very closely which is why it is so important to always monitor your thoughts and you emotions so we can always take full accountability and ownership of our full spectrum being as a whole. So often we all get caught up in those emotional traps between others, because we receive an energetic signal/warning from our HEART/SOUL which is infinite and eternal; ever lasting life. This HEART is OUR SOUL connection between others and it is so very different between the Ethereal/Emotional connection between others, because it does not catch us in a trap of disconcerting cycles of mental programming. Our Etheric Cords may need to be cut as often as possible so that we can be within our own space and time in order to take full accountability and ownership of each our own individual issues of discernment which most always come down to a necesity to heal our childhood issues. Everyone needs to go through the process of healing those issues of our childhood and that's how our SOUL HEART shines an Energetic Expression through our Astral Body to let us know how we are truly feeling at the SOUL level which is always an energetic signal or warning that is then expressed through our Emotional Body. And THAT is our Emotional Connection between all others. These are our Emotional Cords. Please understand that there is a much more healthy way to interact with others and its based on INFINITE and UNCONDITIONAL LOVE. This is our true SOUL Connection and it is not at all based on Ethers, not our Etheric Body and certainly NOT ever about getting us into traps based on faulty mental programming and emotional cycles. Our TRUE connection between others is based on our SOUL HEART and these are the HEARTS and SOULS of all of us living incarnate as our SOUL STAR SYSTEM as individuals. Our Spiritual Heart lives within us and its not our PHYSICAL HEART. It is our INFINITE HEART and ETERNAL SOUL. This is how we can truly connect to one another, my brothers and sisters. It is our Rainbow Cords that gives us the gift of Empathy; our Heart Connection. How do we do this? 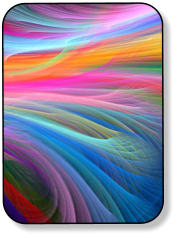 We, as Full Spectrum BEINGS, are an incarnate manifestation of the Rainbow. Each of our Energy Centers is a specific Ray/Color of the Rainbow. This bridge between Souls, or should I say this bridge between our Spiritual Hearts is our RAINBOW CONNECTION and we do this through RAINBOW CORDS. These are not based on emotional traps. These are not based on faulty mental programming. These RAINBOW CORDS are based on our DIVINE INTENTIONS which comes from the LIGHT of our HIGHEST SELVES. Staying within our INFINITE and UNCONDITIONAL LOVE of our SOUL HEARTS, we can maintain healthy and stable relationships between any and all other SOULS living incarnate or otherwise. I know it can be so difficult to speak to others and to open your Spiritual Hearts up to others, because we've all been broken so many times in our ETERNAL LIFE. This angelic DNA lives within all of us and that's what we all carry on from life to life; our cosmic and eternal memories. This is our WISDOM of EXPERIENCE carrying over from a culmination of ALL THAT WE ARE and all that we have been. Please try to stay in the vibrational frequencies of ALL THAT WE WILL BECOME based on of each our divine intentions. That is how we can manifest our GOLDEN FREEDOM of BEING. That is how we become a FULL SPECTRUM RAINBOW BEING, by manifesting the highest light of our future vibrations into our physically incarnate BEING. We each and every one of us carry this INFINITE and UNCONDITIONAL LOVE eternally so and in ever lasting life whether we are falling asleep, consciously aware in our dreams, whether we are passing on in death, whether we are living incarnate, or if we are chosing to ascend, this is our RAINBOW CONNECTION. It is time to truly open our hearts brothers and sisters. It is time to let go all the faulty programming coming in from habitual behavior, television "programs" etc.. It is time to cut those Etheric Cords between others when they cause us to fall into emotion traps, because these can cycle out of control and leave us in fear of opening our true HEART and SOUL. Open your HEARTS!!! <3 <3 <3 Yes Ethereal Cords can be healthy and can be extremely "Heart-Warming" between one another, so don't think that it is unhealthy to embrace the Etheric Nature that WE ALL ARE because this is also part of our AURA. Our Aura is NOT only Magnetic. It is Energetic as well as Etheric and that is the manifestation of our Physical Incarnate Conscious BEING. Please don't take what I wrote about emotional traps frighten you about connecting to others emotionally, because that is what allows us to embrace the true nature of our beings. The point of all this is that so many can only remember the heartache from past experience and that keeps them from opening their SOUL HEART which creates, faulty programming and emotional traps that cycle out of control. Please open your SOUL HEARTS to others, because then we can truly embrace the cosmic nature that we are as Multidimensional, Full Spectrum Rainbow BEINGS of the Cosmos. Open your HEARTS 1st and then embrace what the true nature of Etheric Cords can be like.. then embrace what the true nature of Magnetic Resonance can be.. then embrace what the true nature of Vibrational Resonance is between others. There are two ways to interact with others when it comes to the ENERGETIC Expression of our SOUL HEARTS. In one way, we allow that Energetic Expression of our HEART and SOUL to guide us with Divine Intentions towards the ever greater intentions of all others we encounter. The other way is to hold our Hearts caught in a cage, or "Chakra" in which case, we can fall into those age-old cycles of chaotic traps of faulty programming and emotional neglect. ♥ Jacob Please consider “Sharing” this page with your friends and family. Or you can “Like” Divine Willpower at the top of the page.